Sometimes, just allowing yourself to write whatever wants to come out is enough to get the words flowing, and a daily journaling provides the perfect outlet for this. But there are times when your brain goes as blank as the page in front of you. It happens. This is why it helps to have a list of creative journal ideas handy. The next time you find yourself looking for some journal entry ideas, I hope you’ll give this article another look (after enjoying it today). With a list of journaling ideas at your disposal, you’re sure to find something to shake down whatever is blocking your writing flow. Sometimes, it’s as easy as reminding yourself why you’re looking for things to journal about in the first place. No doubt, you already know some of the benefits of journaling, and one reason may stand out from the others. Here’s a list of known benefits, in case you haven’t learned them all. Whether you use daily journaling prompts or just write whatever is on your mind, knowing how to journal opens a word of self-discovery. Journaling gives you a safe space to explore creative things and to ask yourself deeper questions. Keeping a journal is also a way to process and keep a list of things you’ve been learning from a new book, course, or online program. The simple exercise of writing someone else’s message into your own words helps you make sense of it by filtering it through your own understanding and perspective. Not only are you then better able to incorporate what you’ve learned, but you’ve also become better at learning. They really should teach this in schools. What you write in your journal is your own, though, and however you get those thoughts down onto the page — as neatly printed (or typed) lines, doodles, mind maps, or a combination of all these — the most important thing is to keep journaling daily. So, there’s no need to ask how to write a journal. Better to ask how journaling can best serve you — and what personal journal ideas can help you make the most of it. 1. Make a journal list. 2. A meaningful quote journal idea. Brainyquote.com is one place you can look for quotes that get you thinking — and writing — about something important to you. Choose a meaningful quote that resonates or that makes you want to argue with it. Choose a favorite positive affirmation or one on which you’d like to elaborate. It can be about your personal development, your career, money, relationships, or anything of great importance to you. 4. Journal about something you’re grateful for. Gratitude and journaling belong together. Start with one thing you’re grateful for, and either expand on that one thing or add at least two more. Pretty soon you'll have a mood-boosting gratitude list you will find very uplifting. 5. Create an “I forgive…” journal entry. No doubt, the words “I forgive” bring a certain person to mind whom you find it difficult to forgive. But for your own sake — so you can move past it — at least journal the words “I forgive ____, and I want only what’s good for him/her,” even if you’re not feeling it. You might preface this journal entry with a memory of something that person said or did that you appreciate. Or you can think of something this person might hold against you, try to see your words or actions from their perspective, and write a genuine apology to them. 6. Write in your journal something someone said or did that made you smile. Think of the last time someone did or said something that made you smile in gratitude or admiration. What was that thing, and what was it about the context of that thing that made you more likely to smile about it? 7. Compliment yourself in your journal. Imagine you’ve been asked to write something positive about someone — only that someone is you. You can also imagine your best friend has come to visit and is greeting you with a heartfelt compliment that you appreciate. This is a creative way to practice some self-love. 8. Journal a description of your morning routine. Maybe you don’t do everything the same exact way every morning (or maybe you do), but there are probably some things you do every morning. Why do you do them, and what new habits would you like to add to your morning routine to give your day a better start? What morning habits would you like to replace with better ones? This question can also be liberating. If you need to allow yourself to articulate these thoughts while answering the question from #9, go ahead. Allow yourself to get those thoughts out into the open. Just don’t allow yourself to be tied down to them. Use them as a chance to air and then evaluate those thoughts. 11. Journal about a milestone you’ve reached or one you’re working toward. Think of an accomplishment that gets you closer to your personal goals. Have you reached it? If not, how close are you to reaching it, and what do you have to do every day to get yourself closer to it? 12. Write in your journal about the perfect day. This can take place in the present or three years from now. Put a description in your journal of the whole day, from waking up in the morning to going to bed that night. 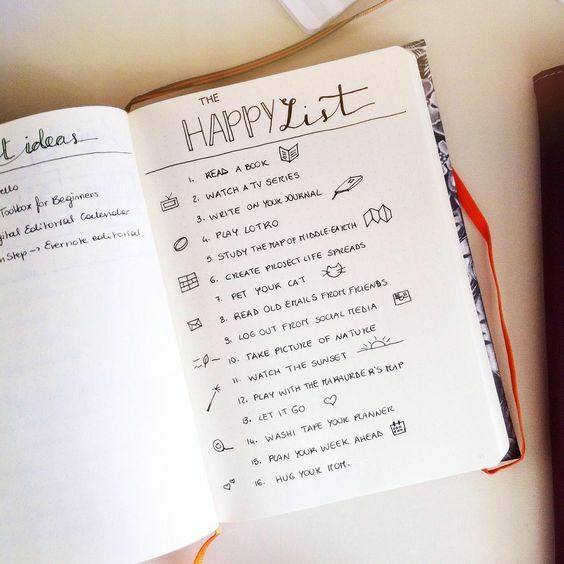 Write down all the important details — the big ideas that make your day perfect. 13. Create an entry with someone who is on your mind (and why). Write about someone you’re thinking about for some reason — someone you miss, someone who’s made you angry, or maybe someone you’d like to meet. It can be anyone, and you can either write about why this person is on your mind, or you can write a script for an imaginary meeting or a necessary conversation. 14. Journal about your vision for the future. Where do you want to be three years from now? Again, you’ll want to focus on the most important elements of that vision. You don’t need to know exactly where you’ll be living or what your new favorite chair will look like (though you’re allowed to). What’s the bigger picture for this vision? 15. Write out your personal vision for this day (your intentions). When you get to the end of this day, how will you want to have spent it? Or what top three things do you want to focus on today? How will this day get you closer to your vision for the future? 16. Journal about the food you’ve eaten and what you will eat today. Whether you’re starting a new dietary regimen or not, sometimes it helps to keep a detailed account of everything you’ve eaten and everything you plan to eat for the rest of the day. No judging. And feel free to make it sound as fancy or as decadent as you want. Try including sensory details in your journal to motivate yourself to practice mindfulness even while you’re eating. Or pretend you’re a food blogger for a day and write about your ideal menu or a meal you had recently at a restaurant. 17. Write about an important event. Whatever event stirs up memories (good memories or the other kind), write about that. Or write about an upcoming event that’s important to you. 18. Describe a challenge you’re facing — or one you’ve overcome. What hurdles have you jumped in your career, with your relationship, or with your personal development? Or what breakthroughs have you had? What challenges remain? 19. Write about your solution to a particular problem or challenge. You probably know solutions to some problems or ways to overcome a particular challenge. Maybe you learned it the hard way. Your journal entry about it could turn into a helpful blog post or even a book. 20. Journal about something you’ve read. Whether you’re thinking of a memorable passage from a book you’re reading, a blog post or article you’ve read recently, or a magazine headline you saw while standing in a check-out line, write about what sticks in your mind and why it matters to you (if it does). 21. Write about a fear you have and how you choose to respond to it. Ever caught yourself dwelling on a fear that you had — or still have? How have you chosen to respond to that fear? Does it hold you back in some way? How will you overcome your fear? 22. Begin a journal entry with a prayer. If you pray to a higher power, your daily journal is a great place to articulate exactly what you want to say. Whether you have questions you need to be answered, or you’d like help with something, writing about it makes it more likely that you’ll get closer to the answers, blessings, and accomplishments you’re seeking. 24. Write a letter to someone. A great journal writing prompt is to write a letter. In your journal you can prepare the message to someone with whom you’re having a dispute, someone you need to reconnect with, or someone you want to share your love for. From there, you can either copy and paste it into an actual message or write it out by hand and send it by snail mail — maybe with a treat you know its recipient would enjoy. 25. Write a letter to someone who has passed. If you never had the chance to tell someone something you needed to say, writing it in a journal can at least provide some closure, even though it’s not the same as actually telling that someone. If it helps, try writing it as a script, with your part and that of the person who has passed on. Make it a conversation that ends in a plausible and satisfying way. Would you like to start now with practicing gratitude journaling? This 90-day journal will help you build an important daily habit of thankfulness and gratitude. Learn to re-discover all the glorious things that are already in your life. 26. Start with a memory (recent or distant). Write in your journal about a memory that has come to you recently — perhaps because something in your life triggered it. Whether it’s a happy memory or not, you might enjoy writing about it. Try to recall as many sensory details as you can. 27. Use an image that sparks an idea for journal writing. If you’ve ever bought a painting that made you imagine a life that might one day be your own, or if you saw an image in a magazine or on the internet that caught your attention and took you places in your mind, write about that. 28. Journal about a dream you remember. Some dreams stick around longer for a reason. What was your most memorable dream, and why do you think you still remember it? What details stand out the most? Is there something about that dream that you want to recreate in your conscious life? Or does the dream represent a fear or concern you need to address? 29. Use a timer for a journal writing sprint. Set a timer for ten to thirty minutes and just write whatever comes to mind. Don’t stop until the timer goes off. Sure, much of what you write will sound frivolous or random, but who cares? Write whatever is trampling over other thoughts to get out the door. Normally, you wouldn’t want to reward such behavior, but thoughts get away with a lot more than we do. 30. Small daily journal sentence. Write a single sentence. Then another. Then a third sentence. You can stop then, or you can keep going. Maybe one of those sentences will trigger something. But even if they don’t, you’ve written three sentences, and that’s something. If you’re not satisfied with just writing three random sentences, make them an answer to a question or write a sentence for each of the three things you’re most grateful for in that moment. 31. A creative character sketch. Write a creative journal entry sketch of a character based on yourself — or on someone you know. Or create a completely fictional character with strange quirks or with a terrible secret. This journal entry might become the starter for a new novel or short story. Or it might just help you get better acquainted with a character you already have. 32. Write about something absurd. Start with a nonsense observation — like “the sun is a radish this morning” or something more ridiculous. Write about how your favorite color is connected to the day of the week you were born and the number of hairs in your father’s left ear. Go crazy with this journal idea. 33. Write an encouraging personal note to yourself. Begin like your writing in a diary and write an encouraging note to yourself about the day you’re going to have or about a challenge you’ll be facing today. Be a friend and write the words you need to hear. 34. Start with your favorite meal. Write about your favorite meal and how it’s prepared. Write about the best time you had when you were able to enjoy this meal — alone or with good company. Why is it your favorite? 35. Describe how your day is going. Write about how your day (or at least your morning) is going so far, what has happened, and what you’re thankful for. Write about the direction your day is taking, and whether it’s the direction you want it to take or you’d like to change course and make it better. 36. Write nice things about someone you’re angry with. I know it’s easier to write about why you’re angry with someone, but try writing only positive things about this person. If no words come to mind, try writing about good things you want for this person. The more goodwill you exercise toward other people in writing, the easier it becomes to forgive them. 37. Write about what you’d do with 10% of your income if you just pulled it out of your bank as cash and went to town. If you took one of your paychecks and pulled 10% out in cash for your own personal spending, what would you spend it on and why? Imagine doing this and describe how you’d feel while you were spending the money. Could you do this on a regular basis? If you’ve never considered doing this, what would you have to do in order to make it a regular thing? 38. Write a description of the kind of person you want to be. Write about the person you want to be, focusing on your end goals and the person you have to be in order to reach them. Visualize yourself as this person and describe your lifestyle, where you live, and how you spend your time. Write about the qualities you admire and want to see in yourself. 39. Write about the power of forgiveness in your life. When was the last time someone forgave you for something? How did that change things for you? What did it do for your relationship with this person — and for other relationships? How did it change the way you feel about this person and about yourself? 40. Write about questions you have regarding religion or universal beliefs. What questions do you have about the afterlife, about religion, about a higher being? What do you want to know about the universe and your relevance and connection to it? How would you answer someone else’s question about what you believe? 41. Write about something that scares you that you have to do anyway. If you’ve ever caught yourself saying things like “I hate driving in the dark! It’s so scary…” or “I’m terrible at making small talk! I make a fool of myself every time,” you already know why you prefer to avoid those things. Now, imagine how differently you’d see those things if you instead told yourself, “Sometimes I really enjoy a nighttime drive,” or “Small talk is nothing to be afraid of. You probably wouldn’t be as anxious to avoid night driving and small talk. What scares you that you have to do anyway? Maybe you have teenage kids with jobs, and you have to pick them up after their shifts end around seven or eight o’clock. Maybe you live in an apartment complex and always run into a small crowd of familiar faces when you’re heading in and out. Write about whatever comes to mind for you, and compose some empowering self-talk to help you get through whatever you have to do that (you think) doesn’t come naturally to you. Not only is it good practice for writing about your fears and how to address them, this is yet another journaling example of how starting a journal can help you become the person you want to be. So, is typing your journal entry as good as writing in your journal by hand? When it comes to the most powerful benefits of journaling, yes. While there are proven cognitive benefits to writing by hand, the important thing is to get your words onto a page — whether it’s digital or something you can touch. The most important thing is to create and maintain the habit of journaling every day (or as close to that as possible). You can always mix it up and do both, choosing one or the other based on convenience or a desire to do something different (or to use that brand new journal). Journal is a way that works best for you. Your brain will be healthier and happier either way. Did you find helpful ideas on what to write in your journal? If you’ve found value in this journaling ideas post, I hope you’ll share it and encourage others to pass it on. The benefits of daily journaling are too good to keep to yourself, and you know you want to contribute to a more self-aware and generous world. So, if this article will help you to thrive today and become the person you want to be, please bless another person today — or as many as you can. And may your generosity and good will infuse everything else you do today. I love this! One of my most favorite ways to journal has been a dialogue between various parts of me. When I’m hurt, I journal from that part. Then I have the validating, caring adult side of me respond. It sounds trippy but it has been really helpful in overcoming some challenging emotions and situations. Great ideas here!